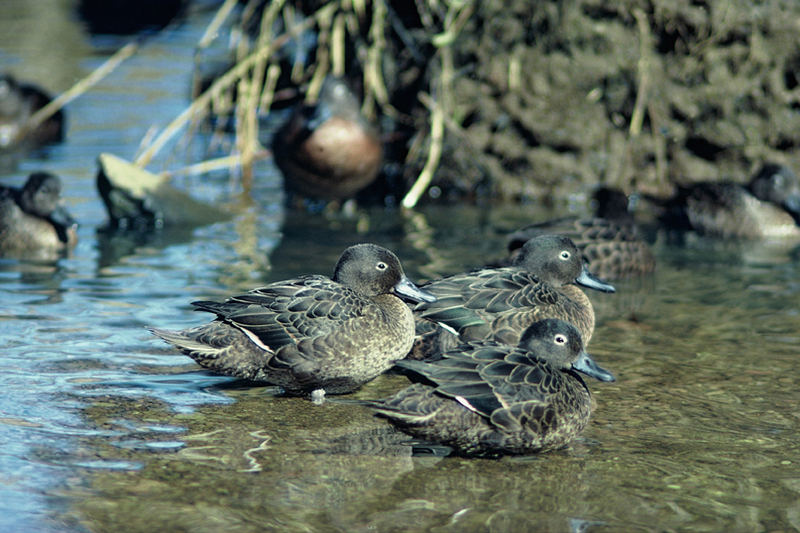 The pateke is a small dabbling duck once widespread throughout New Zealand, but now with only 1000-5000 remaining in the wild. It is endemic at the species level. Efforts to establish new populations in predator-free areas mean that pateke is now classified as Recovering, but requiring ongoing management and more self-sustaining populations. Tuhua (Mayor Island) has recently been cleared of pests and is gradually having its habitat restored; it’s an extinct volcano and has a couple of crater lakes which were home to pateke until the 1950s. John Heaphy from DOC has been re-introducing various species to the island and organised a transfer of captive-reared pateke to Tuhua.The 28 birds were brought together in Christchurch for disease screening and fitting of transmitters for post-release monitoring, then on 14 February 2006 were transported over 700 kilometres by plane and chopper for release within a few hours. 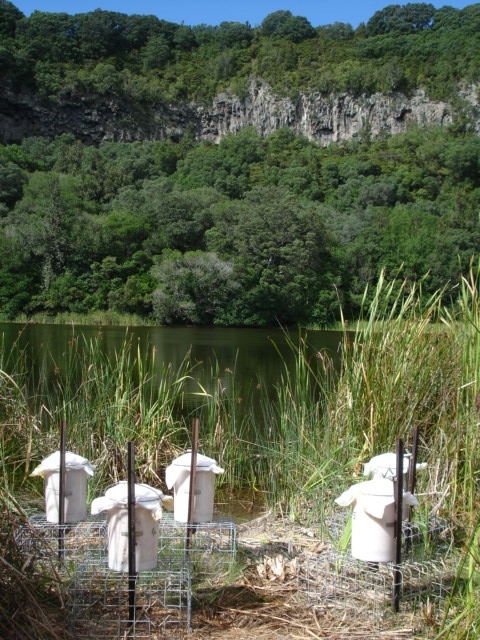 John initially provided supplementary feeding and has monitored the birds periodically. By September 2006 a minimum of 9 pateke (probably quite a few more) remained on the island, and the first four ducklings had been seen, the first bred on the island since 1953. A couple of birds flew to the mainland, where they were killed by predators within days of arrival (John found them when doing an aerial sweep of the mainland to look for missing birds- time of death could be determined from information taken from the transmitters). We did a second transfer in March 2008 of 29 birds, and supplementary feeding finished in November 2008. Breeding has been confirmed each year and there will be very few of the founder population left by now. The ducks have become very secretive and have learned to watch out for Harriers (kahu) which patrol the lakes looking for a feed. They are very difficult to count as they don’t seem to flock as much as other populations. John suggests high 30s as a conservative minimum population. Barry and Sue were lucky enough to get over to Tuhua during May 2011 and saw several small groups of pateke. The project is supported by Isaac Wildlife Trust (captive breeding), and by Fauna Recovery New Zealand (two translocations totalling $15,500).